Spotify teamed up with a fitness researcher to put together a playlist that can give you the ultimate workout! Hit play! Can’t get enough of the song “Can’t Hold Us” by Macklemore & Ryan Lewis? You’re not alone. Spotify recently revealed the most popular tracks that keep people working out, and shared an ultimate workout playlist based on data from their service and a scientific analysis of songs that make us work harder. “Can’t Hold Us” appears more frequently than any other song on Spotify’s 6.7 million worldwide workout playlists. What other songs will keep you going when you’ve had enough of the elliptical machine or don’t want to lift another weight? Spotify also found that men exercise most frequently during lunch breaks and later in the week, while women are more likely to work out before breakfast and at the beginning of the week. Tracks such as “Eye of the Tiger” by Survivor and “‘Till I Collapse” were popular on men’s playlists, and women preferred songs such as “We Found Love” by Rihanna and “Can’t Hold Us” by Macklemore & Ryan Lewis. They also find that women more commonly use music to exercise with the beat, or synchronously. Those rhythmic beats as in those songs make for repetitive types of exercises. Arlene Rudo, a fitness instructor from New Jersey, says that how you program songs is a huge factor to producing a quality workout. She starts with an upbeat song to start a workout, then uses a few songs with the same beats per minute, especially in cardio. And have fun with your playlist, too. Change it depending on the time of year, Rudo suggested. Joey Gonzalez, a celebrity trainer and COO of Barry’s Bootcamp, said they try to match runs and exercises to the beat of the music. “For example, timing the treadmill sprints to the chorus of a track with a great hook, or playing a slower song with bass for incline jogs, and even matching steady, consistent beats for long endurance runs are all part of our strategy,” Gonzalez said. Dr. Costas Karageorghis, deputy head of the School of Sport and Education at Brunel University in London, said to increase the intensity of workouts by one or two beats per minute beyond one’s comfort zone. This will increase the workrate slightly and you likely won’t notice. Spotify worked with Karageorghis to create what they call the ultimate playlist. They say the playlist matches workouts with popular tracks, starting with a warm-up song and then goes into high intensity and strength training tracks. Finally, it ends with a cool-down track. 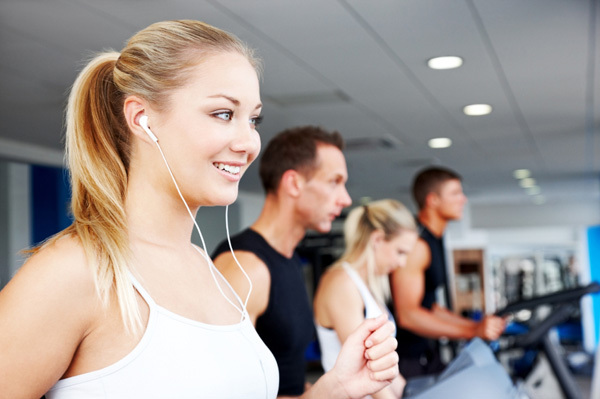 What song on your MP3 player always gives you a great workout?